Perhaps what I love most about summer is how energized it can make you feel to check things off your must-try lists. For me, that means a lot of exploring around San Francisco, in which, I fully embrace playing "tourist." Yes, after living here for over two years now, my first cable car experience was only a mere few weeks ago. (The line always looks too long -- but definitely was well worth the wait!). 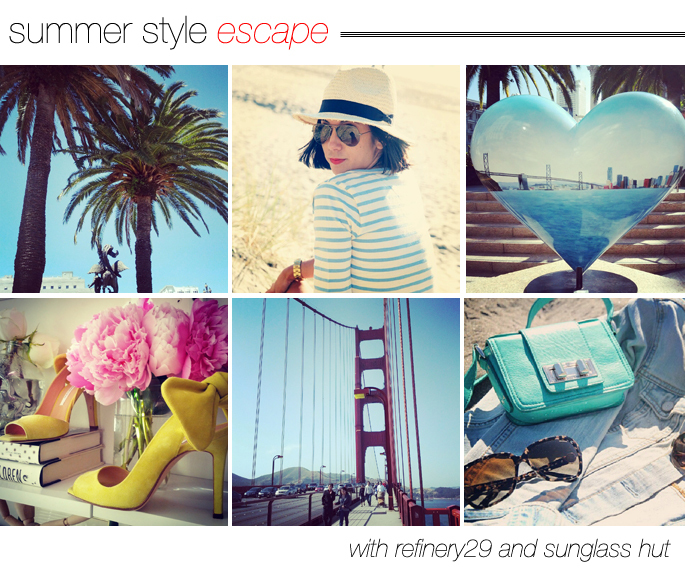 That said, when Refinery29 and Sunglass Hut asked me to share a bit of my San Francisco summer, I was more than happy to let them (and you!) in on my escapades. Click on over to Refinery29 to see my whirlwind SF tour and, of course, my trusty sunglass rotation that hasn't left my side since! wow, your picture are really inspiring! :)) Love it. great pics..heading over to refinery 29 now..and those palm trees..would kill for them in NY..lol! awww, i've only been to san fran once but it sure is beautiful! i really need to play tourist in my home town!!! San Francisco is really beautiful, you can never get tired of it. Beautiful photos - I'll definitely have to check out the feature. That's one of the things I love most about summer too, exploring. Hopefully one day I'll move to somewhere where there's more to explore. Wow your summer looks pretty picturesque, wish I was in SanFran after reading about it! I want those shoes !!!! love love LOVE those yellow shoes!!! We are traveling to San Francisco in just a few days, so very fun to see what you have done! The yellow heels are gorgeous!!! Looks like a perfect summer! Love those bow shoes and the turquoise bag!